REMNANTS is a non-verbal film that explores the rise and fall of the Neolithic civilisation of Britain via motion controlled, digital timelapse cinematography. In one of the longest continuous cultural developments ever known, for nearly 3000 years the people of the Neolithic era constructed some of the most enduring monuments in the world – standing stones and stone circles. Having been dismissed for centuries by much of academia as the work of "illiterate barbarians," research in the 20th and 21st centuries by a handful of persistent investigators has revealed these Megalithic sites to be not only amongst the oldest, but perhaps the most profound. Little is known of this civilisation, and its people have all but vanished without trace. All that is left are their remnants, and they too, in the crush of ‘progress’ are disappearing. 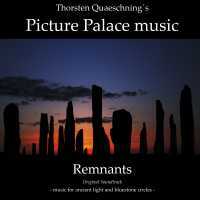 This is the music that is from this film by Thorsten Quaeschning´s Picture Palace music.